Alberta has some of the best and most challenging golf courses in Canada. And with the majestic Rocky Mountains in the west, quality service and friendly western hospitality, your “golfing” Bridge to Adventure in Brazeau Tourism Country awaits you. Plan your summer golf getaway at any of the four Golf Courses in the area: the Big T Golf Course, Raven Meadows Golf Resort, Birchwood Village Greens Golf & Country Club at Lindale, the Breton Golf Course at Breton and the Drayton Valley Golf & Country Club. Raven Meadows Golf Resort is an 18 hole mature course, having been built in approximately 1978. The course is a par 72. It is easy to walk although very long. The greens are irrigated and so in excellent condition. There are challenges with water hazards, long grass off the fairway, and stands of trees on some of the fairways. The course is great for fall golf, as the course trees are mostly evergreens, thus eliminating the problem of an abundance of leaves. There are several tournaments and group golfing functions scheduled every year as well as course sponsored fun tournaments and, weather permitting, 1 or 2 night golf nights. Raven Meadows has a fully stocked Pro Shop. Raven Meadows also offer a campground, hotel and restaurant with a discounted round of golf offered with two night stay in either their campground or hotel. 1 mile south of Hwy 13 intersection on Hwy 22. 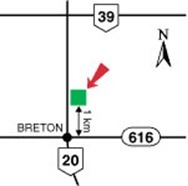 Located just one kilometer north of the village of Breton on Highway 20, the Big T Golf Course features an 8 room motel, RV park and campsite with full hook-ups. This nine hole course has a Par 36 and a driving range. It boasts an island green and is great for those who want to enjoy a nice afternoon on the course. The rolling terrain is tailor-made for golfers who like to hit the long ball, and they’ll have a blast tearing up the course’s almost 3,300 yards of fairway. Golfers are advised not to throw caution to the wind, for this course still has plenty of challenges that can sting the incautious golfer. Water is in play on three holes and many of the greens require well placed approaches. Rentals are available and the service is great at the licensed restaurant and lounge. 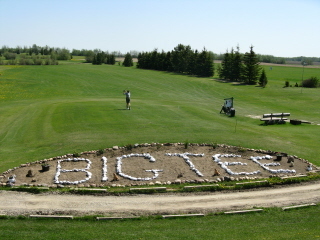 Ideal for tournaments and get-togethers, call 780-696-3883 or 780-696-3886 to set up your tee times. 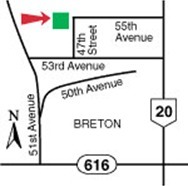 Easily reached from both Leduc and Drayton Valley along Highway 20, the Breton Golf Course is a 9 hole course, with a Par 36. The Centraplex features a licensed restaurant and lounge, dining area, dance studio, skating pavilion, and of course, a Pro Shop. Rentals are available. Playing through tall stands of birch, poplar and spruce, Breton’s fairways are home to much wildlife including deer and many varieties of birds. With few hazards, play at Breton is straight ahead, but golfers will still have to keep their drives on target to stay out of trouble. This is most true on Breton’s signature hole, the 425 yard 7th. Not overly long for a par five, this hole requires accurate shot making, especially on the tight approach to its green. Open 7 days a week, April through October. 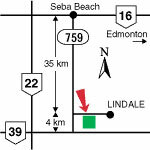 For more information, call 780-696-3531. 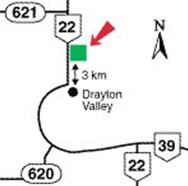 The Drayton Valley Golf Course is an 18 hole course with a Par 71. There is a full-time pro on site at the Pro Shop who would be quite happy to give you pointers and help you with your game. The Drayton Valley Golf Course features a practice putt, licensed restaurant, and rentals. This course features broad fairways and large, rolling bentgrass greens. If golfers are to experience difficulty here they will find it in the large water hazard that crosses the 3rd, 4th and 7th fairways, or in the thick growths of birch and spruce that line most of the course’s holes. Drayton Valley’s most difficult hole is also its longest. At 554 yards from its back tees, the 14th hole requires accuracy off the tee to avoid trouble near a landing zone that is guarded on the left by a small pond, and on the right by trees. Trees on either side of the narrow fairway will plague the golfer all the way to the green, making a hook or slice very costly. For more information, or to book your day on the greens, call 780-542-3602. Clustered around picturesque Buck Lake Creek just west of Lindale, the Birchwood Golf and Country Club is a nine hole golf course with a Par 35. The Pro Shop is equipped with everything the avid golfer will need, including a busy rentals department. Most impressive is the clubhouse complex which includes an indoor swimming pool, sauna, tennis courts and horseshoe pitches, making Birchwood Golf and Country Club a complete year round recreational facility. The golf course’s nine holes are clustered around picturesque Buck Lake Creek which crosses no less than four fairways and is in play on three others. When water isn’t a concern players have to contend with strategic tree placements and the course’s unforgiving rough on what is one of Alberta’s more challenging nine hole layouts. After your game, a relaxing stop at the licensed restaurant will be what you need before you settle down in the Birchwood Campground. Birchwood Golf and Country Club also features banquet facilities. For more information, call 780-542-3400.